Weekly Module and Plug-in updates. Module additions or updates that add more advanced features. A Focus on Full Service: Maintaining websites is tedious and technical so let us do it for you. If you are a VisualRush client that has a website with a WordPress CMS backend, this package is for you. The VR Website CMS Maintenance & Security Package will not only help with the occasional updates to the pages, modules, design, and even features of their website, but the very important – and often overlooked – task of keeping the site core updated and safe from hacks and brute force attacks. Normally, website updates and issues are handled on a per-event basis at my current hourly rate ($95/hr), but for a limited time, this package also includes 2.5 hours of time that can be used over the course of the year for additional updates/changes. Core Updates for Security – The WordPress Core install is basically the version of WordPress your website is running on top of. It is constantly being updated in the community, but it is up to individual site owners & editors to apply these updates. These updates are EXTREMELY IMPORTANT as they are often incremental security updates that protect your site from hackers and internet “bots” that are ever-present and causing problems with websites. This can be a scary proposition and a LOT of things can go wrong when one hits that little “UPDATE WORDPRESS” button. (I normally hide this – and a few other Core features from most clients anyway so that you do not accidentally create problems for your site. Long term though, this can get your website behind and it will become insecure.) If your website is over 1 year old then you are probably behind on multiple WP versions and dozens of Security Updates – Leaving your website vulnerable. A Regular Backup Safety Net – Your website is built on a database that stores all your page contents and interacts/connects/talks with your custom template and any number of custom plugins we have installed for functionality. During any update process (Whether a core update or just a plugin update), should any of these connections be inadvertently broken (as can sometimes happen over the internet) your site may begin to throw out an error, or come down completely. VisualRush makes this nearly zero risk as we take regular off-site backups of your website and would be able to restore these when problems arise, to keep your website – and business – up and running at it’s peak. Website Changes Made Easier – While keeping the WordPress core and plugins updated, and the site & files backed up is in itself a very important and sometimes time-consuming process, as a bonus this package currently also includes up to 2.5 hours of development time* (a $225 Value) which enables you to simply email and/or call with things you would like updated/added, or questions, concerns, learning, and update techniques. This time can supplement an existing Discount maintenance package, or may be all you need for the year. *Limited Time Offer for New Signups at this price. Time/Price of offering may change in the future so sign up today! If your website went offline today, would you be able to get it back up and running? We have put together an exclusive set of WordPress Training & Tutorial Videos that are kept updated with each new WP version and Each new WP feature. It also goes over the YOAST SEO Plugin – one we tend to use on most new Websites. (If you don’t have it yet, we will install it for you under this package.) PLUS we are always adding in access to professional paid plugins at no additional cost to help better solve issues and help making your business website more useful and efficient. My favorite out of these is GRAVITY FORMS PRO and NOTIFICATION BAR PRO. If you have any questions or are interested in this package for your website – Please Contact Us Today! 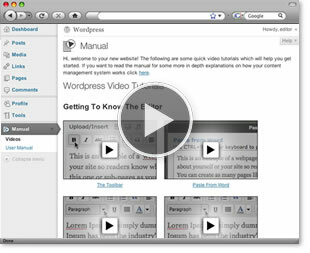 Over 30 Videos on many areas of your new website and how to control it. Interested in a Responsive Website Design? Starting around $3,600. All new site designs include a slew of features such as Mobile Friendly Responsive Design, SEO Optimized, Full CMS/Admin Area (allows you to make changes to your website content & photos), unique navigation design, consultation, contact form, setup/upload and 1 month of FREE Updates. CMS Security, Update & Maintenance Combo Package Included on all VisualRush Developed websites. *web custom domain names are additional.